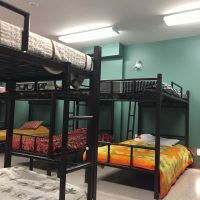 Services are offered to homeless Aboriginal men and women (First Nations, Metis and Inuit) living in Montreal. Projets Autochtones du Québec works with local communities and government agencies to promote the development of the person and the control of his life. The interventions mainly contribute to the accompaniment, development and animation of groups dealing with various social issues. 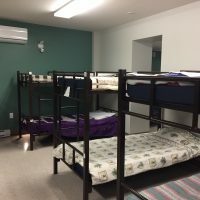 The accommodation unit has 12 beds reserved for women and approximately 36 beds reserved for men. The opening hours for residents are from 18:00 to 08:30, Monday to Sunday. A team of experienced and actively involved Aboriginal and non-Aboriginal stakeholders and practitioners ensures continuity of service to internal and external residents and participants in various projects. The role of the team is to bridge the gap between the Aboriginal population and the various service points and community organizations that help First Nations, Metis and Inuit in Montreal. 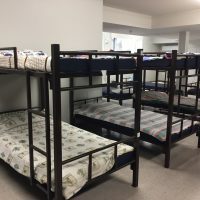 The team ensures that participants can be in a safe place, a place of respite where they have access to basic care, clothing, active listening and capacity building. Stakeholders encourage participants to become involved in the community life of the center through a variety of means, from small daily actions to organizing activities, where they are able to put into practice their skills and share their interests and passions. The intervention approach chosen by Projets Autochtones du Québec is a horizontal and informal approach. Interventions are self-help oriented with a touch of humility: team members realize that they have as much to offer as they do to learn from customers. The creation and maintenance of stakeholder-participant quality and trust relationships and the relationship of sharing, knowledge and culture are both objectives of the organization and the identity of the team working within Projets Autochtones du Québec. The psychosocial worker uses a personal, holistic approach that helps clients achieve a healthy lifestyle. Help with resume writing and cover letters. Some cases may require ongoing and regular care with intervention plans tailored to the needs of some clients. If therapy is needed, the psychosocial worker provides support for the timely procurement of government services. 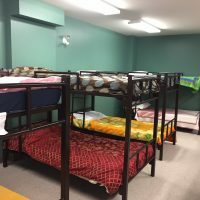 The psychosocial worker for the shelter’s clients also has the opportunity to offer her services to referrals from other organizations and partners in Montreal and surrounding areas. The psychosocial worker at the shelter is available from Monday to Friday, from 9:00 to 16:00. The Liaison Agent for the Prevention of Aboriginal Women Victims of Violence and Sexual Exploitation has a mandate to understand the different factors (societal, historical, institutional, community, family or individual) that cause women aboriginal people in Montreal (such as those who attend Projets Autochtones du Québec) to be kept in situations where they experience violence, sexual exploitation, without really having access to community or socio-legal services that may come to them. Once these factors are better identified, Quebec Aboriginal Projects will be able to make specific recommendations and work with the various partners in the community to set goals and an action plan that will allow these women to access the program. help they need.